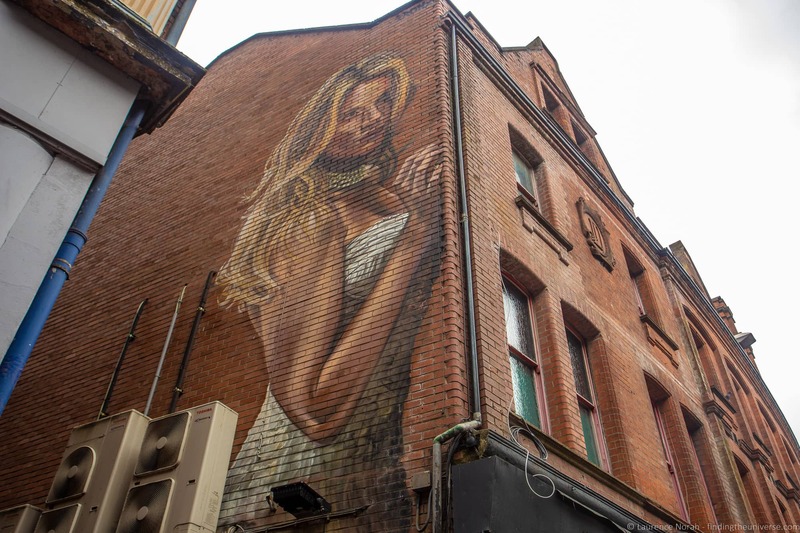 One of our favourite things we did when we were in Belfast was to take a tour of Belfast’s street art. The city is well known for its political murals, but in recent years there has been a growth in street art of a less political nature, meaning there is a wide variety of different types of art to take in. 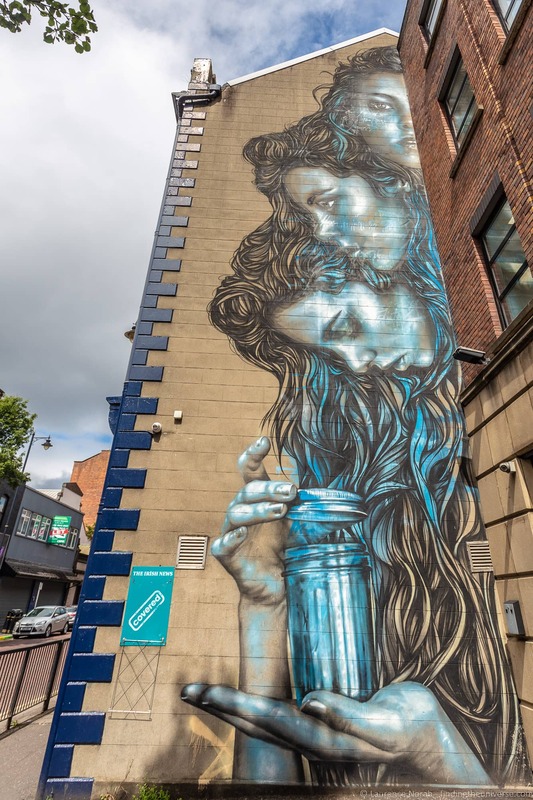 In today’s post, I’m going to share some photos of Belfast’s street art, and then provide you with the information you need to take your own tour of the street art of Belfast – including all the different types of art you can see, and your options for finding them. Note there is a lot of street art in Belfast, far more than I could fit into one post, or even find. These are just some of my favourite pieces, starting with the contemporary street art murals, the majority of which came about as part of various initiatives to promote art on the streets. I really liked this piece, which reminded me of a similar piece of street art in Glasgow. This, it turns out, is because it’s by the same artist, the Australian street artist Sam Bates, also known as Smug. There are a lot of different subjects covered on Belfasts walls. This one, we were told, must have been technically challenging due to all the fine lines – not easy with a spray can. I can believe that! 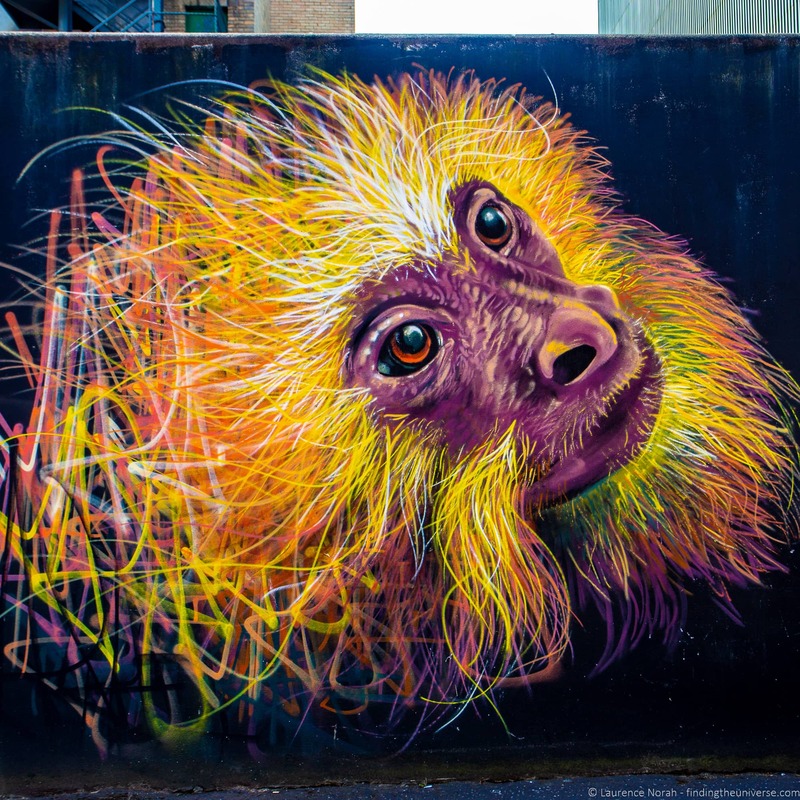 It’s by artist Louis Masai. Street art can definitely be thought provoking. This one is titled “The son of Protagaros”, and is by the street artist MTO. Protagoras was an ancient Greek philosopher who it is thought did not believe in God. The dove in this image represents the dove of peace, killed by arrows marked with the crosses of the Knights of Malta and the Latin Cross. So you can make of that what you will. This was one of my favourite pieces because I love dragons and space! It’s a space dragon, with every part of the dragon made up from a spaceship that featured in Star Wars. From the head, you can see Jabba the Hutt’s pleasure craft, and then as you work back you will identify more. 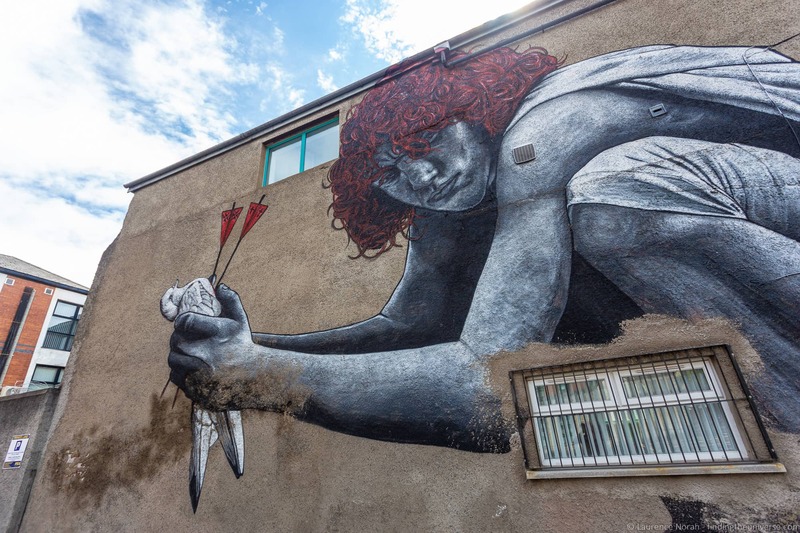 This one is by Bristol based street artist Andy Council – Bristol of course being famous for it’s street art, as well as being the home of street artists Banksy. 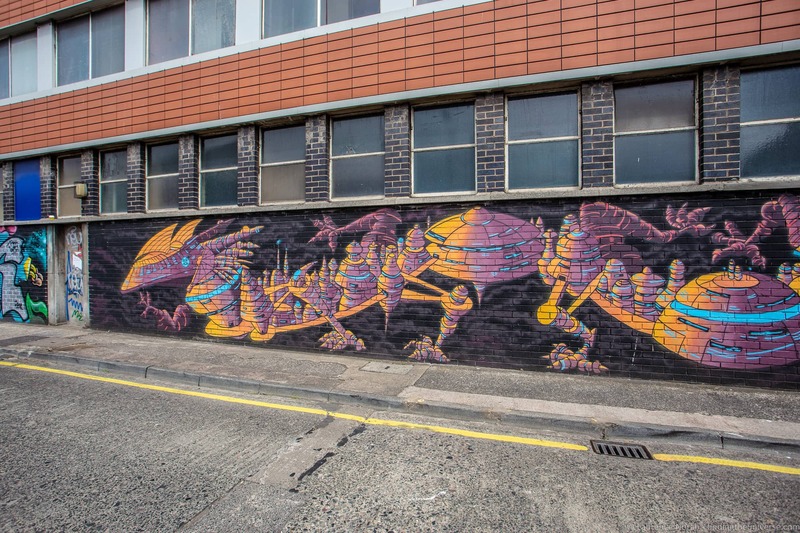 Check our our guide to the street art of Bristol for more. 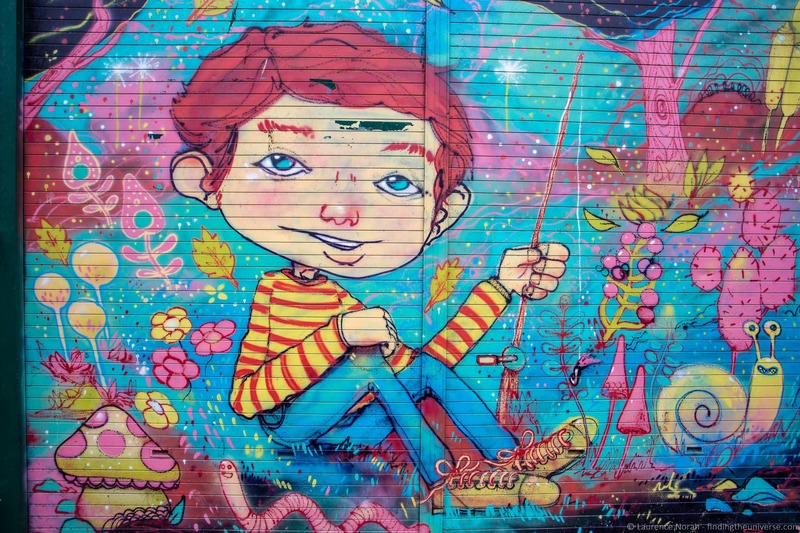 This whimsical art piece is found on the shutters of a former fishing tackle shop which is now an art shop. As the shutters are rolled away when the shop is open, you’ll want to visit outside of opening hours to see this piece by street artist Elph. This is another work of incredible detail that definitely warrants a close up look. This was a new one on me – 3D street art! As you can see from the writing above the piece, “3D Glasses in Sunflower”. Sunflower is the pub over the road, but in our case, our tour guide had 3D glasses we could use. I’ve never seen three dimensional street art, so this was pretty cool! This one is by the artist EMIC. Another really awesome piece, this one by Christina Angelina, also known as Starfighter, which represents Pandora’s box. The three characters represent the same person, in various stages of opening and not opening the box. Very Schrödinger’s Cat. Here’s a picture of some street art with a street artist! This is Tim, aka Verz, who was leading our tour of the street art in Belfast. He is also the artist behind this piece, and he specialises in art featuring dogs. Originally Verz largely did images of dog breeds that were often negatively perceived by the public, with the idea of sharing the idea that perception is not always truth. This image, on the other hand, if of his own dog. Which is obviously, very cute! This collection of street art is directly opposite the Duke of York pub, down an alleyway by the Dark Horse pub, and features a great many scenes of figures from Belfast history. Occasionally private events happen at these pubs, which means you might not be able to come all the way in to the courtyard. So now it’s time to share a few of the political murals. You can also find these throughout the city. We saw most of them while on our Black Cab tour as many of the more political ones are outside the main tourist areas. 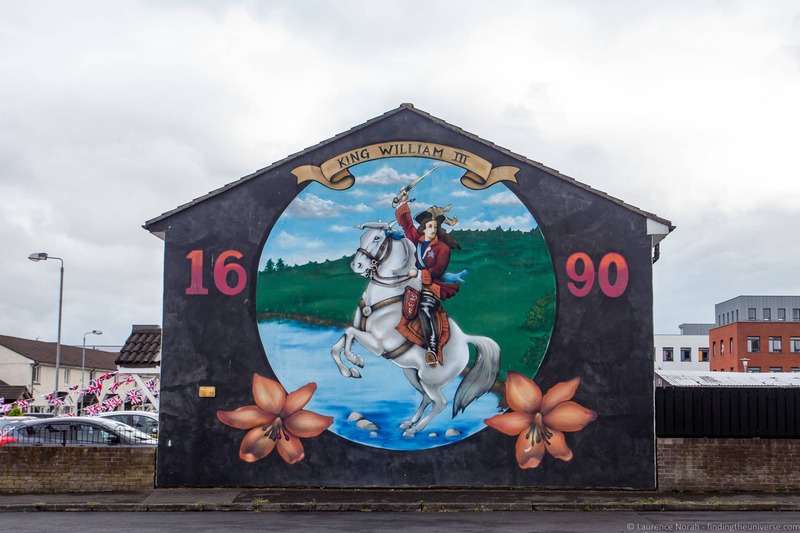 We’d definitely recommend seeing these as part of a tour, as the guide will be able to explain the history and significance of the murals as well as Belfast’s fractious history. For those of you not aware, Northern Ireland is a part of the United Kingdom, and has been since 1921, when Ireland was partitioned up. Northern Ireland at the time was largely made up of unionists, who were predominantly of the Protestant faith, whilst southern Ireland, or the Republic of Ireland, was generally made up of nationalists, largely of the Catholic faith. Of course, this split wasn’t perfectly even, with both sides living in each country. 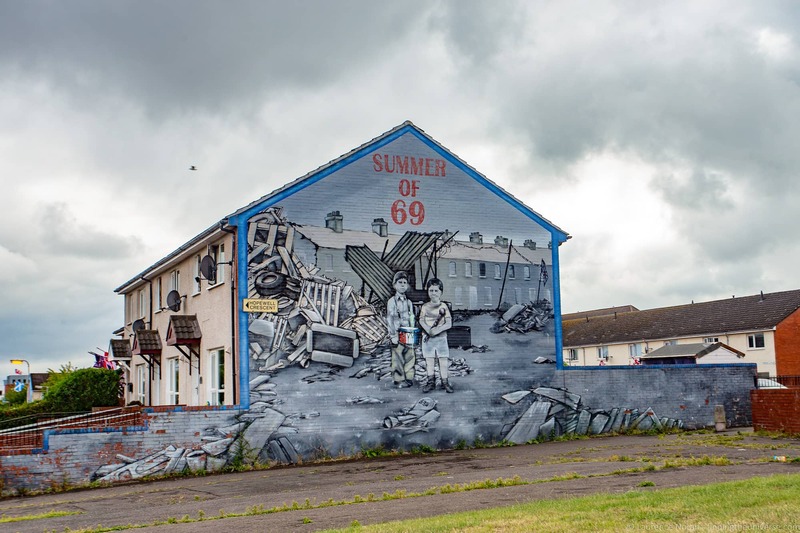 This division down lines of belief and national identity within Northern Ireland and the Republic of Ireland led to three decades of violence, generally known as the Troubles, which had a significant impact on life in Belfast. This conflict is deemed to have ended in 1998, with the signing of the Good Friday Agreement. Obviously, two paragraphs is insufficient to summarise thirty years of trouble, and the full history of a country, but that will give you something to look up at least! The summer of 69, other than being a classic song, was also the last summer that brought us the sixties “summer of love”, and other, free-spirited, peace loving vibes. Belfast didn’t quite experience this type of revolution unfortunately, and this mural seeks to show what the summer of 69 might have been like in the city during the Troubles. 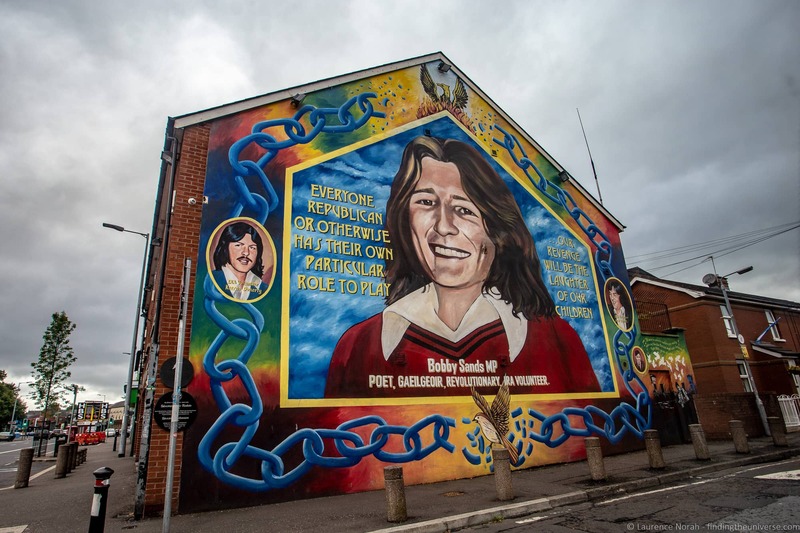 This is a mural in tribute to Bobby Sands. Bobby was a member of the paramilitary group the Irish Republican Army, also known as the IRA. He died in prison in 1981 whilst on a hunger strike. 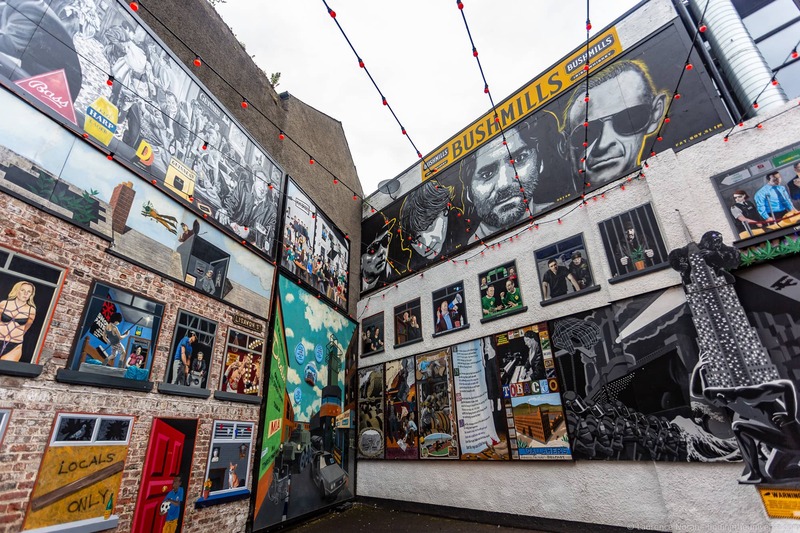 Many of the political murals take up long stretches of street, depicting a wide range of scenes from Belfast’s history. King William III, also know as William of Orange, or King Billy, was the King of England, Ireland and Scotland. He was a Protestant who fought the Catholic King of France, and the Orange Order movement is named for him. To this day, every year the orange order marches in celebration of his victory at the Battle of the Boyne in 1690, when he defeated the deposed English King James II, and ensured the Protestant faith in Ireland continued to rise in strength. Of course, it’s not hard to walk around Belfast yourself and see street art, as there’s a lot of it on the sides of buildings here. 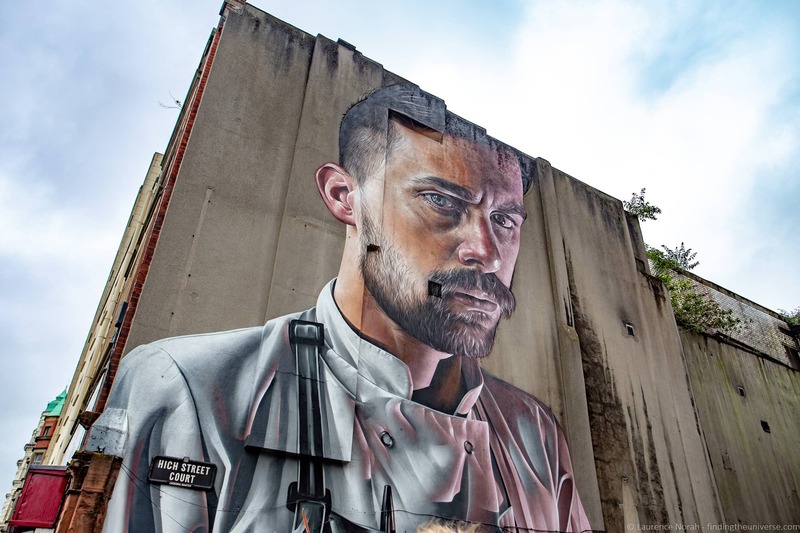 There are also regular street art festivals and events taking place in Belfast, meaning that there will always be new pieces to see, and that many of the pieces in this post will likely be replaced in time. 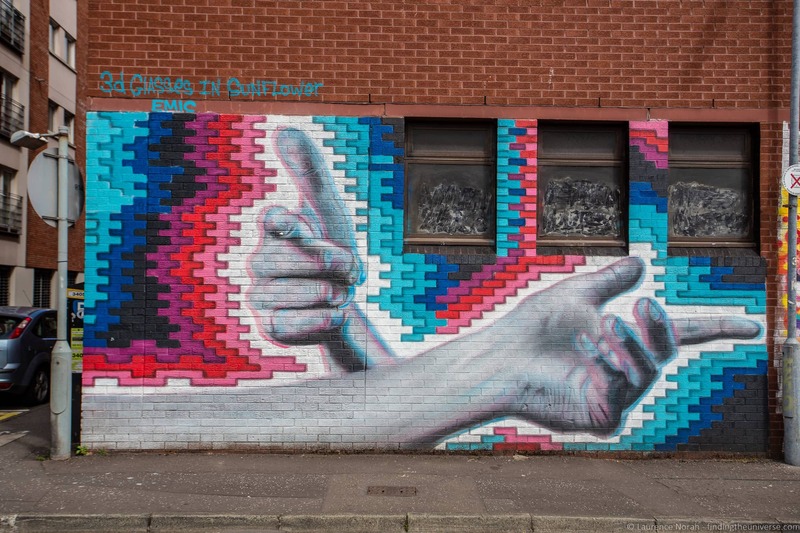 This website contains a fairly up to date map of the street art in Belfast, divided by type, which is a helpful resource. 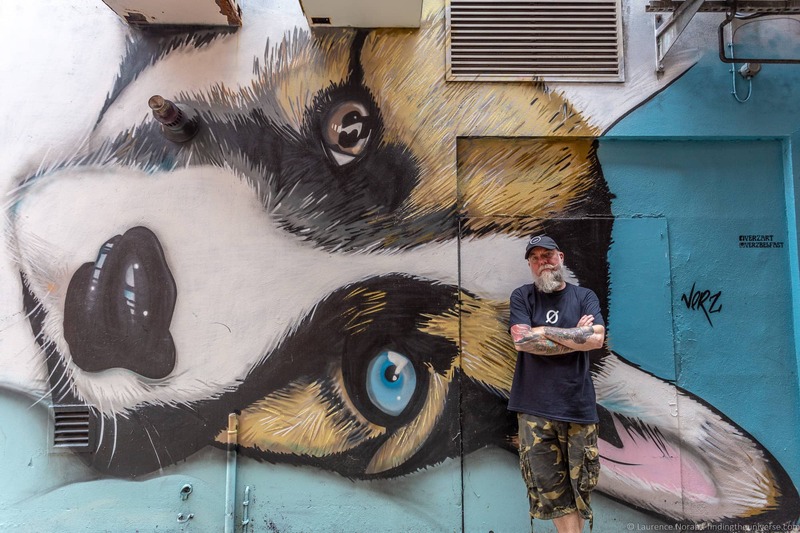 If you want to get a better understanding of the art as well as the stories behind each piece, we can very much recommend that you take a street art tour. 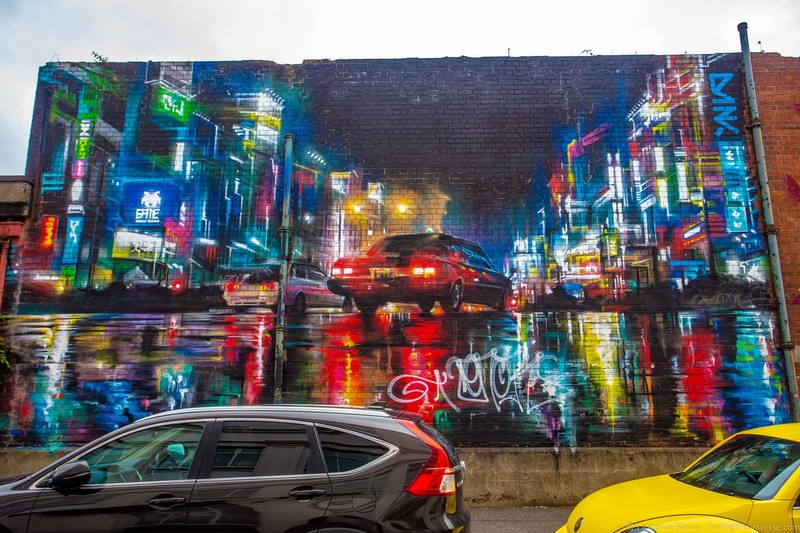 The two tours that we can recommend are the street art walking tour with Seedhead arts, and the Black Cab Mural tour with Touring Around Belfast. Both these tours are run by Belfast locals, but they have somewhat different foci. The street art walking tour with Seedhead arts focuses on the recent, more contemporary street art, and shares information on some of the art works, as well as the artists behind the pieces. The tour is given by actual street artists, and is a great insight into the current street art scene. 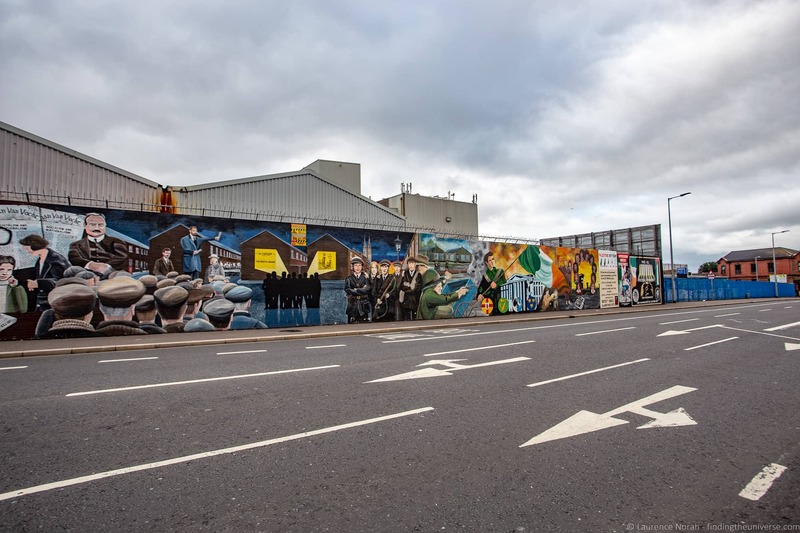 The Black Cab Mural tour, led by blue badge guide Billy Scott, is both a tour of the city itself, and also an insight into Belfast’s troubled recent history, known as the The Troubles, part of which is shared through the political murals painted in parts of Belfast. These murals, which represent various political viewpoints, religious beliefs, events, and figures, show a different side of the city. We’d argue that both tours are worth going on, although of course it’s up to you. The walking tour is currently a weekly event, held at midday on a Saturday, although other times can be arranged subject to availability. The Black Cab mural tours are run on demand, just get in touch with Billy via his website to set that up. If Billy isn’t available (he’s a very popular tour guide), you might check out this tour instead. 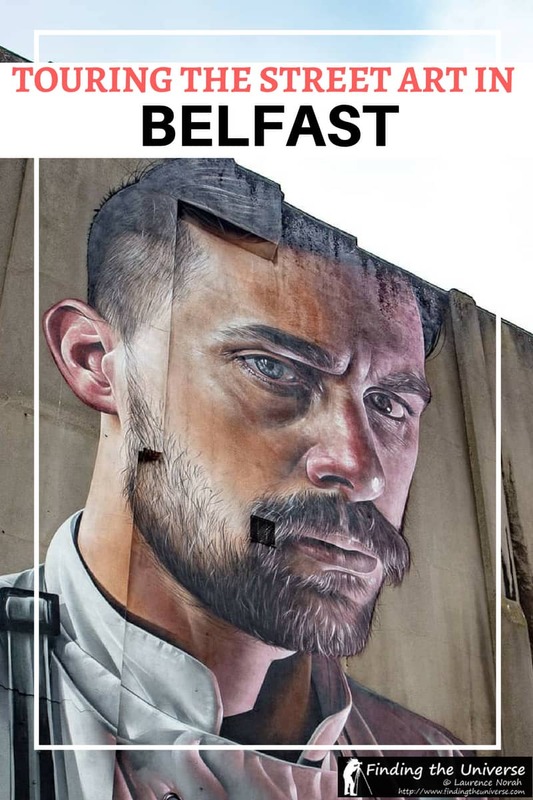 Hopefully this post has helped inspired you to seek out the street art of Belfast on a future trip to the city! We’ve got a lot more content to come on Belfast which we’ll be linking to below, so do check back and don’t forget to subscribe to get updates on new content, which you can do here. In the meantime, here’s some content to help you along with planning your Belfast trip. And that’s it! 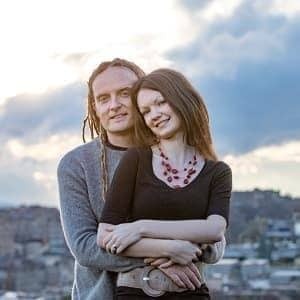 Hopefully you found this post useful. As always, if you have any feedback or questions, do let us know in the comments below. Can’t wait to visit Europe!! Love these images so much, thanks for sharing!